New to PageCloud? I’m writing about my experiences and guides to getting set up and using the tool. If you’re like me, you’re wondering where to find the information to add your Custom Domain to your PageCloud site. I dug around for a bit and found information on this directly from PageCloud’s support pages. To help you get on board, here is my guide on how I set it up. I broke it up into two parts. 2. Choose your name of your website. This will be the name of your new website. This is also an alias for your website. 3. Click “Create” when you have selected the name you want. This is your custom domain name registrar that currently manages the domain “name” for your website. You’ll need one if you want to have a Custom Domain name for your website. If you don’t have a domain name registrar, search online for “domain name registrar” as PageCloud does not currently offer domain name registrar services. I personally use CrazyDomains and GoDaddy, but there are pros and cons with any provider. I am leaning towards CrazyDomains for it’s simple user interface. But please choose what makes sense to you. The screenshots and steps below are of my view within the CrazyDomains portal. But it’ll look similar with your choosen domain registrar as well. Change your A-record so that it points to the PageCloud proxy server at IP address 52.4.76.39, this is so that you can set your website domain name host to route traffic from “yourname.com” to PageCloud’s webhosting server. The webhosting server on PageCloud’s servers is only where your website will be hosted. Click on “Modify” and update the A-Record to IP address 52.4.76.39. Click “Update” once you’re done. 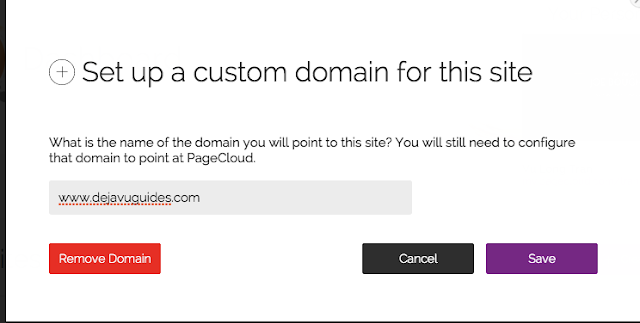 Make sure you also add in your Custom Domain on PageCloud’s website hosting servers. You can do this inside your PageCloud Dashboard. 5. Wait and your website should be live. It may take 24-48 hours for your DNS settings to resolve. This means, the servers may take a bit of time to point visitors from your domain name “yourname.com” to PageCloud’s website hosting servers. Then, you should be all set!